Left-handers are creative. Left-handers are geniuses. Half of all cats are lefties! (Or so says Stink.) But Judy is a righty . . . and Judy is feeling left out. 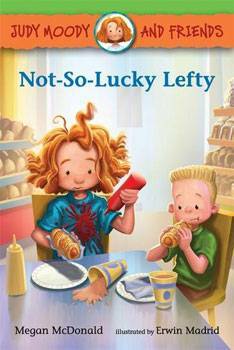 Tomorrow is Left Handers Day, and Stink and Dad, the southpaws in the Moody family, are celebrating at the pretzel factory. Judy is allowed to come along on one condition: she has to be left-handed " the whole entire day. It's on! Megan McDonald is the author of the popular Judy Moody and Stink series for older readers, as well as many other books for children. Megan McDonald lives in California. Erwin Madrid has worked as a visual development artist for the Shrek franchise as well as creating conceptual art for video games. He is also the illustrator of The Scary Places Map Book by B. G. Hennessy. Erwin Madrid lives in California.